Victoria's virtues are many and varied, with some of the best weekend escapes in the country – but how do you get up close and personal with the wonders of this fair state without breaking the budget? Find yourself some free accommodation, of course. A few boat ramps are about the most you can count on for 'facilities', but if you want a private getaway for some serious bush camping, this peaceful retreat on the edge of the Grampians National Park, about five hours from Melbourne, may well be the answer. While the area is known for its boating, fishing, yabbying and bird-watching opportunities, finding your own private place to pitch a tent is easy with over 400km of shoreline to choose from. Make camp in mountain country at the Lightening Creek camp in Jarvis Creek Regional Park, a bit over four hours from Melbourne. 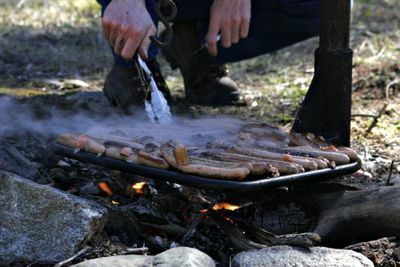 There is a small BBQ area available in the middle of a secluded valley surrounded by lush vegetation and a forest of tall gums populated by native wildlife. The drawback is that the valley camp is small, making it hard to stake out your own turf if someone snags it first. Several other camps are nearby, including The Plateau, which are more established as rest-stops. For a free holiday spot beside the seaside that's only about an hour from Melbourne, try Johanna Beach, just off the Great Ocean Rd. This large, grassy site has toilet facilities and is located just behind the dunes for easy access to the beach and several bush-walking tracks. With plenty of free facilities, including shower blocks (no drinking water) on the banks of freshwater fishing haven, Lake Colac, this is the place to go for those wanting to explore Corangamite with its Lakes and Craters region, volcanic plains and floating islands. 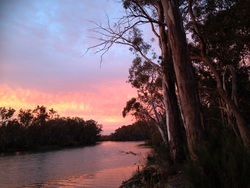 At the top end of the state, Christie's Beach, near Echuca, around three hours north of Melbourne, provides a shady bush camp on the Murray River, with basic facilities such as toilets and fireplaces. While the camp itself may not be anything special, its setting in the Echuca Regional Park means that it's a peaceful, though popular, place to enjoy the river. Whether in the middle of the bush, in the mountains, by a river, lake or sea, Victoria has camping covered – often for free. Let us know your favourite place in the state to camp on a budget. We always enjoyed Jimmy's Creek. Approximately halfway from Hall's Gap to Dunkeld. Confluence of two creeks. Small toilet block. Tank water available. Good spot to explore the Grampians without being near the shops - with all that entails. Gunbower island on the murray river is also really pretty. set amongst red gum forest, with lots of little twists and bends, and branching tracks to pitch a tent away from "neighbours. the island is massive. and not too far from "mainland" if you forgot something... or didn't catch any murray cod for dinner. ive seen kids tape long sheets of plastic together to make a big slide from their camp site straight into the murray. lots of kangaroo and emu wandering around as well. Many free camps in the "JAMEMISON"area with river sites, toilets and fire places. O' Briens Crossing is between Baccush Marsh and Ballarat.It doesw get a lot of through traffic during the day. Another camp in the area is "FIRTH PARK"Less traffic with toilet/tank water and fire places. 90 mile beach, near Sale. Great for long beach walks. Campgrounds provide basic toilet facilities. BYO water and everything else! Does anyone know of a free bush campsite within about 100 km from the Rosebud(Mornington Peninsula) area. No 4WD access.???? Dinner Plain, High Country of Victoria. Dinner Plain is a village located just 10km out of Mount Hotham on the Great Alpine Road - one of the greatest touring routes in Australia. Whilst you can't set up over winter, you can park and setup your RV or caravan over summer (November to May). There are clean toilets and a RV dump spot to empty out waste and fill again. Dinner Plain has somewhere for breakfast, lunch and dinner and a "real" bed if you want. There are heaps of picturesque walks to experience. visitdinnerplain.com for more information. Sheep yard flats approx 3 hours from melbourne central closer from the eastern suburbs. Very popular in the usual holiday times of Easter and Christmas and most weekends in summer. Basic toilet facilities throughout the park. The Howqua river runs through the area popular for trout fly fishing, motorbike riding or just sight seeing. Very good allweather road access so 4 wheel drives not required. If you can get there during the week it's as peaceful as. Golden beach toilets no louts and down the road is a $2 hot shower.